My favorite space in our new house is the sunroom. It’s straight ahead when you walk through the front door, and our back door leads outside on the left side of it. 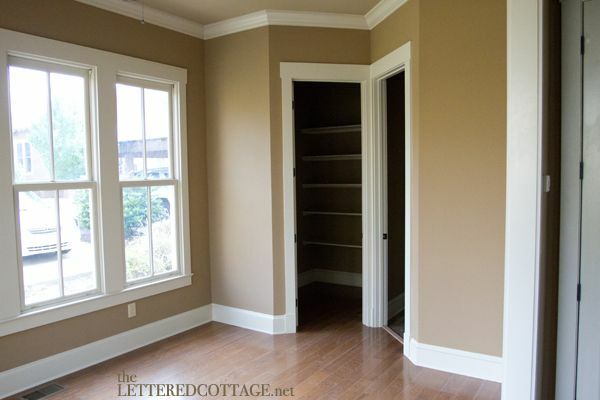 On the right side of the room, there’s a large storage closet and a half bath. Can’t wait to cottage it up! 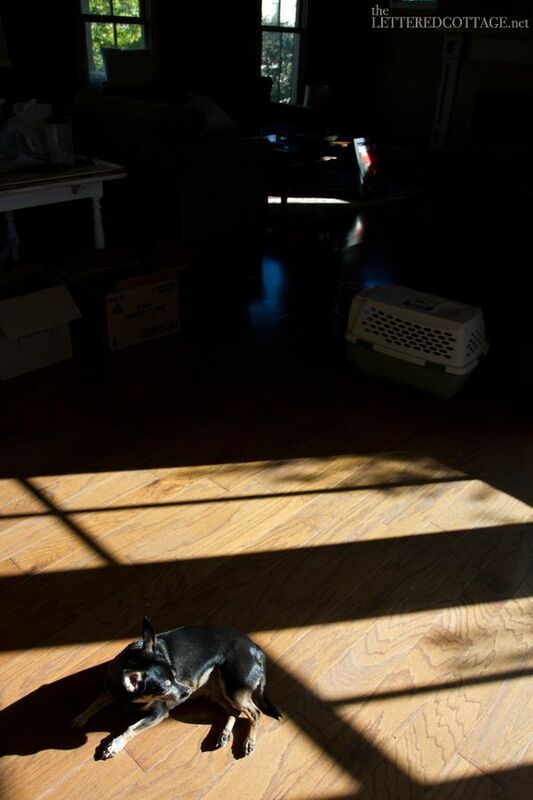 The first thing we moved into the sun room from our old house was our piano. And when I say, “we”, I mean- professional piano movers. 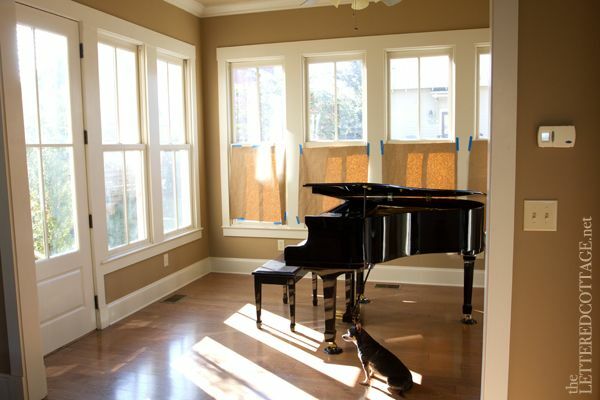 The second thing we moved in there was window treatments…a.k.a- a roll of brown Kraft paper and some painters tape. 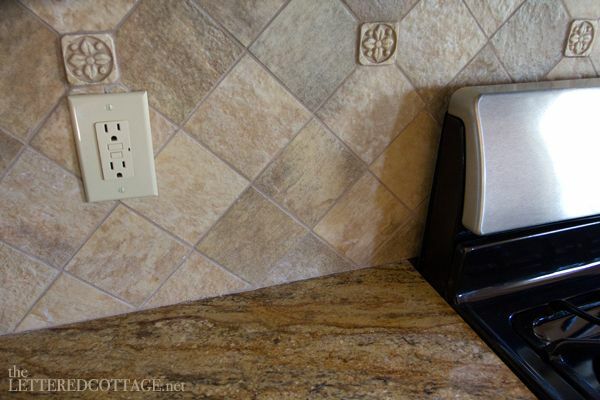 There are a few important things missing from this house. 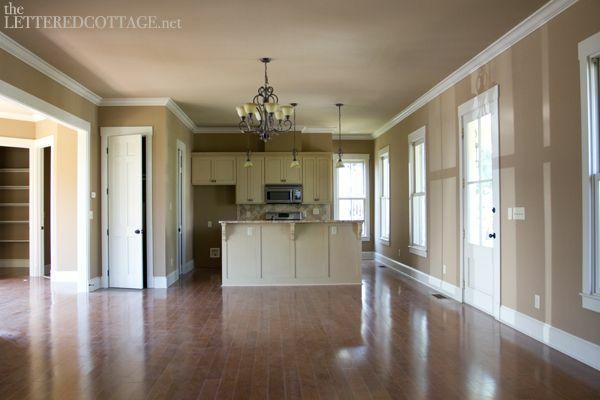 None of the kitchen or bathroom cabinets have shelves in them, and none of the windows have window treatments on them. We haven’t decided how we’re going to permanently handle either of these issues yet, but the Kraft paper taped to the bottom half of some of our windows seems to be doing the privacy trick for now. If you look to the left when you come through the front door, you see the living room. And if you’re anything like me and Kev, you see a wall full of white-painted built-in cabinetry and a total fireplace makeover, too- ha! 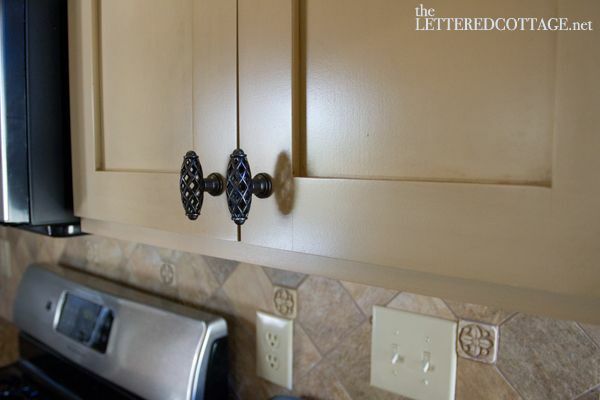 If you look to the right when you come through the front door, you see the kitchen. It’s small, but it’ll work fine for us, and there’s a generous pantry off to the left side of it. Right now, everything is pretty neutral, neutral, neutral, and new, new, new- so we look forward to injecting some cottage-style character in there in the future. Our pets have been adjusting to the new house pretty well. They LOVE sunning on the sun room floor in the morning. 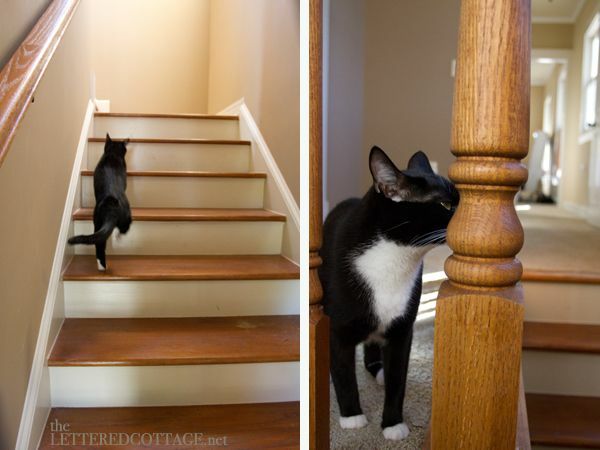 Tomorrow, Kit-Cat and I look forward to blogging about the upstairs. He should have it all sniffed out by then. Very pretty. I agree that the fireplace needs a bit of a makeover.. It’s currently a bit understated and plain, but with the type house you’ve bought, it could be completely gorgeous. I cannot wait to see y’all reveal it, but I know its probably not your number one priority right now! No shelves in the kitchen?! How is that possible? Wow, the POTENTIAL!! This place is awesome…wouldn’t I love to have a place so open, a clean slate to work with. Can’t wait to see what you do with it! It is exciting to think that you will be bringing your kiddos home to THIS HOUSE. Good luck! What a beautiful bones house to start your awesome transformation to make it your ‘home’! Wonderful home that will be even more beautiful when you put yourselves into it! It has been great seeing all of your projects and now a new home to do even more! So beautiful – so happy for you guys! Love it ! Cant wait to see what follows! So beautiful, but not nearly as pretty as when you get finished with it, I’m sure. How exciting! 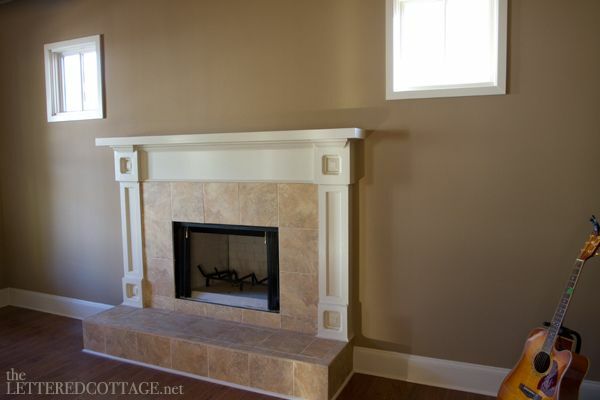 I can’t wait for the fireplace wall re-do! My husband and I bought a house back in February, and our family room looks extremely similar. I’ve been agonizing over it ever since. 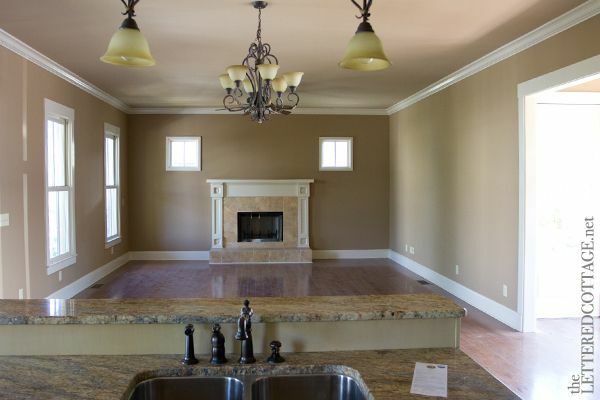 I really feel it needs built-ins, but the fact that the fireplace sits almost flush with the wall makes it hard to imagine how to make it work. And the large expanse of wall to the right! Mine is still empty because I don’t know what to do with it. I’m really looking forward to seeing what you do with the room. I definitely can use some inspiration! Congratulates on your new home! It’s gorgeous as is, but I can’t wait to see how you guys “make it your own”! A little behind in my reading. I couldn’t believe I had missed the house tour posts. It’s just beautiful and I can totally picture white built ins around the fireplace. So far I am just in love with your new house. Anyway, I LOVE those stairs. Have totally always wanted to have stairs walled on both sides, so that the steps themselves become the focal point. Just a thought, but lettering the risers would be awesome. With song lyrics, or scripture? As per this photo. Love it. Good luck with your renos! Wow! You guys. What a great find! I can’t believe no-one snapped it up in all those years. I am so excited to see all your changes. 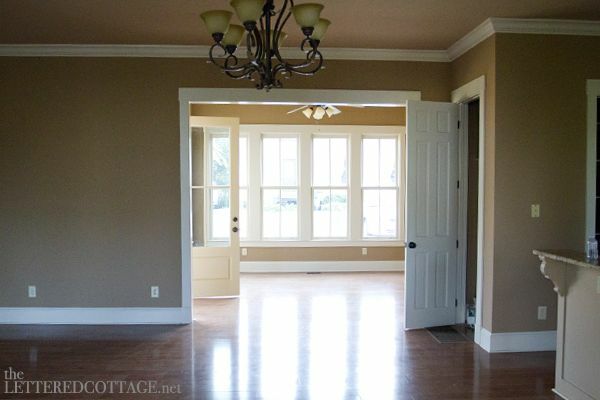 Yes to the “wall full of white painted cabinetry” This house will transform so well. Congratulations…. Hi! I love the house. 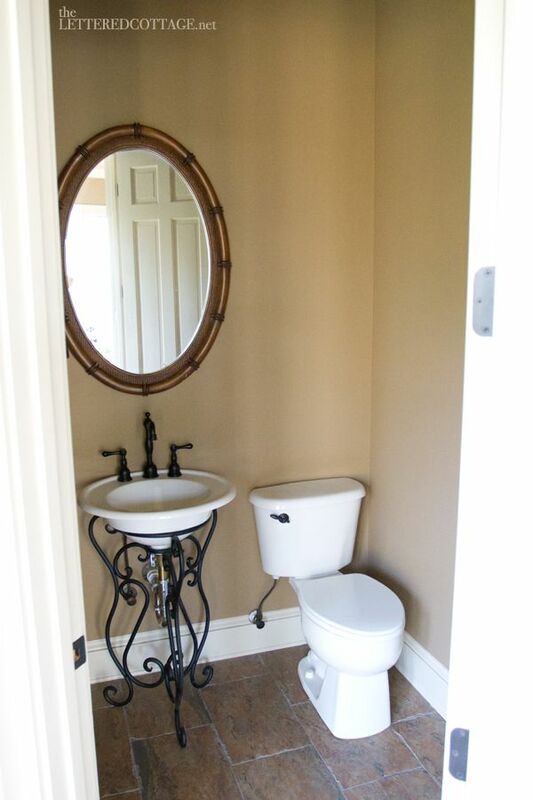 What paint colors did you use throughout the house? I love the color. Just stumbled upon your blog and adding it to my reader! 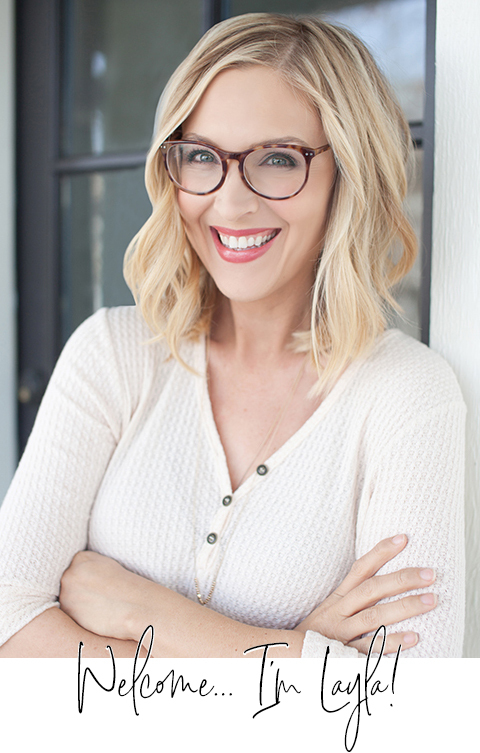 I’m looking forward to reading more about your renovations and redesigns and getting some inspiration for my home! I know that you got your home almost a year ago but I wanted to comment anyway! I absolutely love your style and I look forward to seeing the changes you make! Your last home was amazing!!! Thank you, Yvonne! 😀 We’ll be blogging about our kitchen and living room changes soon! I moved into my very own house at the beginning of May…but my progress was stopped by a fractured broken wrist. You have to watch those stepladders! I have a cat named Kit Kat too–she’s a ragdoll and gorgeous! Your new house is lovely and much nicer than your previous one. Good luck fixing it up!